(1) The international preliminary examination report shall be established within the prescribed time limit and in the prescribed form. (2) The international preliminary examination report shall not contain any statement on the question whether the claimed invention is or seems to be patentable or unpatentable according to any national law. It shall state, subject to the provisions of paragraph (3), in relation to each claim, whether the claim appears to satisfy the criteria of novelty, inventive step (non-obviousness), and industrial applicability, as defined for the purposes of the international preliminary examination in Article 33(1) to (4). The statement shall be accompanied by the citation of the documents believed to support the stated conclusion with such explanations as the circumstances of the case may require. The statement shall also be accompanied by such other observation as the Regulations provide for. (a) If, at the time of establishing the international preliminary examination report, the International Preliminary Examining Authority considers that any of the situations referred to in Article 34(4)(a) exists, that report shall state this opinion and the reasons therefor. It shall not contain any statement as provided in paragraph (2). (b) If a situation under Article 34(4)(b) is found to exist, the international preliminary examination report shall, in relation to the claims in question, contain the statement as provided in subparagraph (a), whereas, in relation to the other claims, it shall contain the statement as provided in paragraph (2). (a) Explanations under Rule 70.8 shall clearly point out to which of the three criteria of novelty, inventive step (non-obviousness) and industrial applicability referred to in Article 35(2), taken separately, any cited document is applicable and shall clearly describe, with reference to the cited documents, the reasons supporting the conclusion that any of the said criteria is or is not satisfied. (b) Explanations under Article 35(2) shall be concise and preferably in the form of short sentences. The international preliminary examination report (otherwise known as International Preliminary Report on Patentability (Chapter II of the Patent Cooperation Treaty)) is established on Form PCT/IPEA/409. (C) 6 months from the date of receipt by the IPEA of the translation furnished under PCT Rule 55.2, whichever expires last, as provided in PCT Rule 69.2. To meet the 28-month date for establishing the report, Office practice is to complete internal processing by 27 months from the priority date in order to provide adequate time for reviewing, final processing and mailing. Thus, under normal circumstances, the applicant receives the report, at the latest, 2 months before national processing at the elected Offices may start. This ensures that he/she has time to consider whether, and in which elected Offices, he/she wants to enter the national stage and to take the necessary action. The international preliminary examination report contains, among other things, a statement (in the form of simple “yes” or “no”), in relation to each claim which has been examined, on whether the claim appears to satisfy the criteria of novelty, inventive step (non-obviousness) and industrial applicability. The statement is, where appropriate, accompanied by the citation of relevant documents together with concise explanations pointing out the criteria to which the cited documents are applicable and giving reasons for the International Preliminary Examining Authority’s conclusions. Where applicable, the report also includes remarks relating to the question of unity of invention. The international preliminary examination report identifies the basis on which it is established, that is, whether, and if so, which amendments have been taken into account. Replacement sheets containing amendments under PCT Article 19 and/or PCT Article 34 which have been taken into account are attached as “annexes” to the international preliminary examination report. Amendments under PCT Article 19 which have been considered as reversed by an amendment under PCT Article 34 are not annexed to the report; neither are the letters which accompany replacement sheets. Superseded amendments are not normally included. However, if a first replacement sheet is acceptable and a second replacement sheet for the same numbered sheet contains subject matter that goes beyond the original disclosure of the application as filed, the second replacement sheet supersedes the first replacement sheet, but both the first and second replacement sheets shall be attached to the international preliminary examination report. In this case, the superseded replacement sheets are to be marked as provided in PCT Administrative Instructions Section 602. Before the preparation of the Chapter II report, a top-up search should be conducted by the IPEA to identify any additional prior art that has been published or has become available subsequent to the date of the establishment of the international search report. The purpose is to discover any intermediate prior art not available during the international search, i.e. 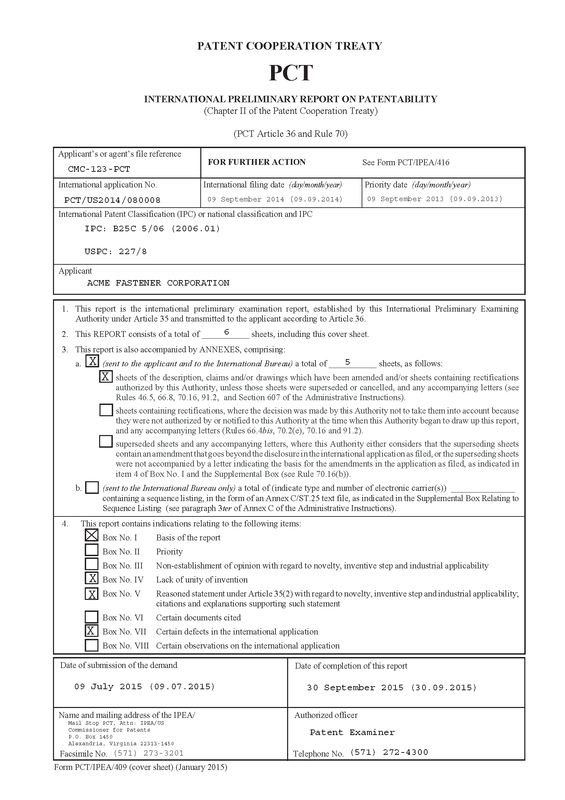 patent application published on or after the filing or, the valid priority date of the international application, but having an earlier filing or priority date. The top-up search should be differentiated from additional search. A top-up search is to find prior art which recently became available, which is not the same as additional search required as a result of a claim amendment to present additional features not previously claimed. A top-up search should be performed in all Chapter II examination, except where the examiner considers performing a top-up search would serve no useful purpose. This, however, should be a rare occurrence. For example, this is the case when it is decided that the international application, in its entirety, relates to subject matter on which the International Preliminary Examining Authority is not required to carry out an international preliminary examination, or that the international application is so unclear or the claims are so inadequately supported by the description that no meaningful opinion can be formed on the novelty, inventive step, or industrial applicability, of the claimed invention. The same applies when no international search report has been established for certain claims and it is thus decided not to carry out an international preliminary examination on these claims. Note, however, that when any of the above situations applies to only part of the claimed subject matter or where there is lack of unity of invention, a top-up search should still be carried out but restricted to those parts of the international application that are the subject of international preliminary examination. Another situation is when the IPEA considers that the documents cited in the International Search Report are sufficient to show there is lack of novelty on the entire subject matter. A further example where a top-up search is considered to serve no useful purpose is when the International Search Report cited novelty defeating X references and no amendment to the claims or comments on the application of art has been filed. If the claims in the international application lack unity, the examiner will first issue an invitation to pay further examination fees and then perform the top-up search on inventions for which examination fees have been paid. The invention paid for must not have been excluded from preliminary examination due to lack of international search in Chapter I. In an application where an Article 34 amendment has been filed but no basis can be located, and/or there is no letter explaining the basis, the top-up search may be limited to the scope of the claims forming the basis for the report. In cases where relevant documents have been discovered in a top-up search and the examiner intends to raise new objection based on the documents, a second written opinion should be issue where the new objection was not necessitated by an amendment. Form PCT/IPEA/409 Cover Sheet. The classification of the subject matter placed on the cover sheet of the report shall be either (1) that given by the International Searching Authority under PCT Rule 43.3, if the examiner agrees with such classification, or (2) shall be that which the examiner considers to be correct, if the examiner does not agree with that classification. Both the International Patent Classification (IPC) and the classification required by the IPEA/US should be given. The cover sheet will also include the date on which the report was completed and the name and mailing address of the International Preliminary Examining Authority. This information is generated automatically by the OACS software when preparing the report. In addition, the examiner must indicate the date on which the demand for international preliminary examination was submitted. The date of receipt of the demand is usually stamped on the first sheet of the demand (form PCT/IPEA/401). When completing Box No. I, item 1 of Form PCT/IPEA/409, the examiner must indicate whether or not the report has been established on the basis of the international application in the language in which it was filed. If a translation was furnished for the purpose of the international search, publication or international preliminary examination, this must be indicated. The international preliminary examination report will be established on the basis of any amendments, rectifications, priority and/or unity of invention holdings and shall answer the questions concerning novelty, inventive step, and industrial applicability for each of the claims under examination. For the purpose of completing Box No. I, item 2, sheets of the description and drawings filed during Chapter I proceedings and stamped “SUBSTITUTE SHEET (RULE 26)”, “RECTIFIED SHEET (RULE 91)”, and “INCORPORATED BY REFERENCE (RULE 20.6)” are considered to be originally filed/furnished pages and should be listed as originally filed/furnished pages. Only those amendments or rectifications to the description and drawings filed on the date of demand or after the filing of a demand should be listed as later filed pages “received by this Authority on ______________." Further, if the report has been based on a nucleotide and/or amino acid sequence disclosed and necessary to the claimed invention, the examiner must indicate the format of the material (i.e., on paper/image or in electronic form (text)) and the time of filing/furnishing (i.e., contained in the international application as filed, filed together with the international application in electronic form (text), or furnished subsequently to the IPEA). 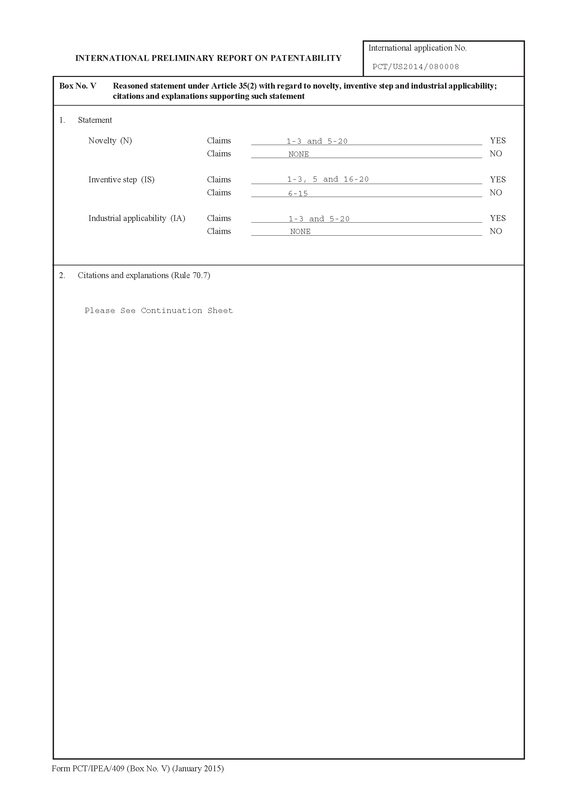 If more than one version or copy of the sequence listing is filed, the examiner must indicate in item 2 whether the applicant has provided the required statement indicating that the information in the subsequent or additional copies are identical to that in the application as filed or does not go beyond the application as filed Item 3 is available for providing additional comments. The examiner must also indicate, in Box No. I, item 3, if any of the amendments filed resulted in the cancellation of any pages of the description, any of the claims, any sheets and/or figures of the drawings, any of the sequence listing. If the examiner considers any of the amendments to go beyond the original disclosure, or they were not accompanied by a letter indicating the basis for the amendment in the application as filed, the examiner must point this out in Box No. I, item 4 and explain the reasons for this determination in the Supplemental Box. New matter which appears on a replacement sheet will be disregarded for the purpose of establishing the report. However, the remainder of the replacement sheet, including any amendments which do not constitute new matter, will be taken into consideration for the purpose of establishing the report. Box No. I, item 5 needs to be marked if the report is established taking into account the rectification of an obvious mistake under PCT Rule 91. Box No. I, item 6 needs to be marked whether or not top-up searches have been carried out by the International Preliminary Examining Authority. If the search was carried out, the date of the top-up search and whether additional relevant document discovered need to be indicated. If any document discovered in the top-up search is used to support any negative statement with respect to any of the claimed subject matter, it should be cited in Box No. V of the report. Documents that refer to an oral disclosure, use, exhibition or other means occurred prior to the international filing date and documents that refer to earlier patent document, but published on or after the international filing date, should be cited in Box VI of the report. Further, Box No. I, item 7 needs to be marked if the report is established taking into account the supplementary international search report(s) from the specified Supplementary International Searching Authority(ies) (SISA). (D) the priority claim has been withdrawn. (D) no international search report has been established for the claims. Where the report has not been established in relation to certain claims only, the claims affected must be specified. If the nucleotide and/or amino acid sequence listing, do not comply with the standard in Annex C of the Administrative Instructions, the examiner must indicate the reason for non-compliance. (E) the examiner was of the opinion that the international application did not comply with the requirement of unity of invention but decided not to issue an invitation to restrict the claims or pay additional fees. In addition, if the examiner is examining less than all the claims, the examiner must indicate which parts of the international application were, and which parts were not, the subject of international preliminary examination. In the case where additional fees were paid under protest, the text of the protest, together with the decision thereon, must be annexed to the report by International Application Processing Division IPEA personnel if the applicant has so requested. Where an indication has been given under item (E) above, the examiner must also specify the reasons for which the international application was not considered as complying with the requirement of unity of invention. The examiner must indicate whether each claim appears to satisfy the criteria of novelty, inventive step (nonobviousness), and industrial applicability. The determination or statement should be made on each of the three criteria taken separately. The determination as to any criteria should be negative if the criteria as to the particular claim is not satisfied. The examiner should always cite documents believed to support any negative determination as to novelty and inventive step. Any negative holding as to lack of industrial applicability must be fully explained. See the further discussion in MPEP § 1845.01 relating to Box No. V of Form PCT/ISA/237. The citation of documents should be in accordance with Administrative Instructions Sections 503 and 611. The procedure is the same as the procedure for search report citations. Explanations should clearly indicate, with reference to the cited documents, the reasons supporting the conclusions that any of the said criteria is or is not satisfied, unless the statement is positive and the reason for citing any document is easy to understand when consulting the document. If only certain passages of the cited documents are relevant, the examiner should identify them, for example, by indicating the page, column, or the lines where such passages appear. Preferably, a reasoned statement should be provided in all instances. (B) the date on which the non-written public disclosure occurred. (B) its filing date, and its claimed priority date (if any). The Report may also indicate that, in the opinion of the International Preliminary Examining Authority, the priority date of the document cited has not been validly claimed ( PCT Rule 70.10). Guidelines explaining to the examiner the manner of indicating certain special categories of documents as well as the manner of indicating the claims to which the documents cited in such report are relevant are set forth in Administrative Instructions Sections 507(c), (d), and (e) and 508. If, in the opinion of the examiner, defects existing in the form or contents of the international application have not been suitably solved at the prescribed time limit for establishing the international preliminary examination report, the examiner may include this opinion in the report, and if included, must also indicate the reasons therefor. See the further discussion in MPEP § 1845.01 relating to Box No. VII of Form PCT/ISA/237. If, in the opinion of the examiner, the clarity of claims, the description, and the drawings, or the question as to whether the claims are fully supported by the description have not been suitably solved at the prescribed time limit for establishing the international preliminary examination report, the examiner may include this opinion in the report, and if included, must also indicate the reasons therefor. See the further discussion in MPEP § 1845.01 relating to Box No. VIII of Form PCT/ISA/237. The name of the authorized officer responsible for the report must be indicated. Pursuant to Administrative Instructions Section 612, an “authorized officer” is the person who actually performed the examination work and prepared the international preliminary examination report or another person who was responsible for supervising the examination. Thus, an examiner need not have signatory authority in order to be named as an authorized officer on the examination report. However, the “file copy” of the international preliminary examination report must be signed by a primary examiner. The total number of sheets of the international preliminary examination report, including the cover sheet, must be indicated on the cover sheet. In addition, the annexes, if any, must accompany the international preliminary examination report. 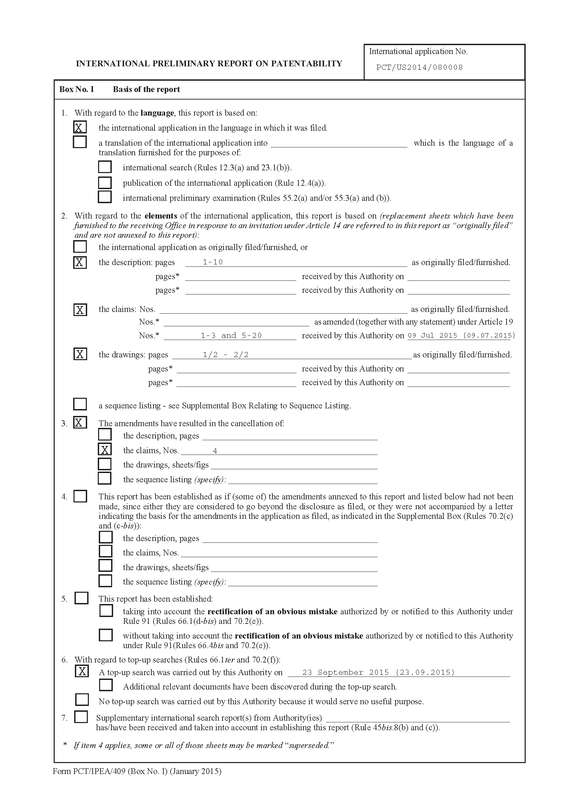 For annexes to be sent to the applicant and to the International Bureau, an indication must be made regarding the total sheets of the following: sheets of the description, claims and/or drawings which have been amended and/or sheets containing rectifications authorized by the IPEA, unless those sheets were superseded or cancelled, and any accompanying letters (see PCT Rules 46.5, 66.8, 70.16, 91.2, and PCT Administrative Instructions Section 607); sheets containing rectifications, where the decision was made by the IPEA not to take them into account because they were not authorized by or notified to the IPEA at the time when the IPEA began to draw up the report, and any accompanying letters (PCT Rules 66.4bis, 70.2(e), 70.16 and 91.2); and superseded sheets and any accompanying letters, where the IPEA either considered that the superseding sheets contained an amendment that goes beyond the disclosure in the international application as filed, or the superseding sheets were not accompanied by a letter indicating the basis for the amendments in the application as filed, as indicated in item 4 of Box No. I and the Supplemental Box (see PCT Rule 70.16(b)). 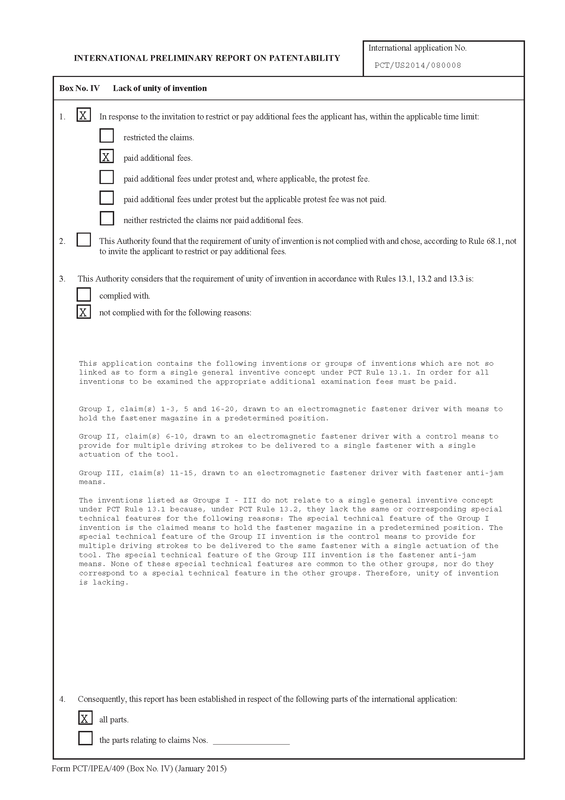 For annexes to be sent to the International Bureau only, an indication must be made regarding the total of the type and number of electronic carrier(s) containing a sequence listing, in electronic form only, as indicated in the Supplemental Box Relating to Sequence Listing (see paragraph 3bis of Annex C of the PCT Administrative Instructions). provided that the International Preliminary Examining Authority shall not start the international preliminary examination before the expiration of the applicable time limit under Rule 54 bis.1(a) unless the applicant expressly requests an earlier start. 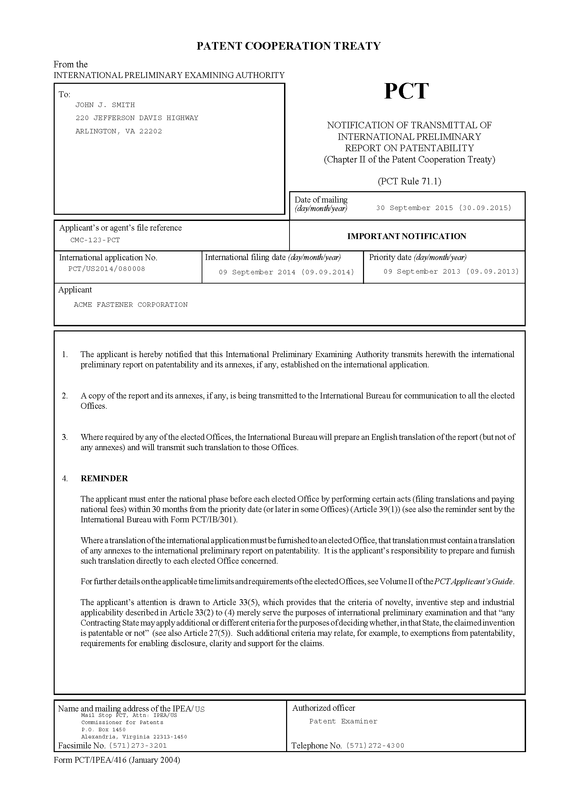 (b) If the national Office or intergovernmental organization that acts as International Searching Authority also acts as International Preliminary Examining Authority, the international preliminary examination may, if that national Office or intergovernmental organization so wishes and subject to paragraphs (d) and (e), start at the same time as the international search. (b-bis) Where, in accordance with paragraph (b), the national Office or intergovernmental organization that acts as both International Searching Authority and International Preliminary Examining Authority wishes to start the international preliminary examination at the same time as the international search and considers that all of the conditions referred to in Article 34(2)(c)(i) to (iii) are fulfilled, that national Office or intergovernmental organization need not, in its capacity as International Searching Authority, establish a written opinion under Rule 43 bis.1. (c) Where the statement concerning amendments contains an indication that amendments under Article 19 are to be taken into account ( Rule 53.9(a)(i)), the International Preliminary Examining Authority shall not start the international preliminary examination before it has received a copy of the amendments concerned. (iii) the expiration of the applicable time limit under Rule 46.1. (e) Where the statement concerning amendments contains an indication that amendments under Article 34 are submitted with the demand ( Rule 53.9(c)) but no such amendments are, in fact, submitted, the International Preliminary Examining Authority shall not start the international preliminary examination before it has received the amendments or before the time limit fixed in the invitation referred to in Rule 60.1(g) has expired, whichever occurs first. (iii) six months from the date of receipt by the International Preliminary Examining Authority of the translation furnished under Rule 55.2. The time limit for preparing the international preliminary examination report is 28 months from the priority date, or 6 months from the time provided under PCT Rule 69.1 for the start of the international preliminary examination, or 6 months from the date of receipt by the International Preliminary Examining Authority of the translation furnished under PCT Rule 55.2, whichever expires first. This time limit is 27 months internally to ensure sufficient time to process, review and mail the report in sufficient time to reach the International Bureau by 28 months from the earliest priority date. (1) The international preliminary examination report, together with the prescribed annexes, shall be transmitted to the applicant and to the International Bureau. The International Preliminary Examining Authority shall, on the same day, transmit one copy of the international preliminary examination report and its annexes, if any, to the International Bureau, and one copy to the applicant. (a) The request under Article 36(4) may be presented any time during seven years from the international filing date of the international application to which the report relates. (b) The International Preliminary Examining Authority may require that the party (applicant or elected Office) presenting the request pay to it the cost of preparing and mailing the copies. The level of the cost of preparing copies shall be provided for in the agreements referred to in Article 32(2) between the International Preliminary Examining Authorities and the International Bureau. (d) Any International Preliminary Examining Authority may perform the obligations referred to in paragraphs (a) and (b) through another agency responsible to it. The international preliminary examination report and its annexes, if any, are transmitted to the applicant and the International Bureau using a Notification of Transmittal of International Preliminary Report on Patentability (Form PCT/IPEA/416). Every effort is made to ensure that the transmittal is effected in sufficient time to reach the International Bureau before the expiration of the time limit set in PCT Rule 69.2. The name of the authorized officer responsible for the international preliminary report must be indicated on the Form PCT/IPEA/416. (a) The international preliminary examination report and its annexes shall be translated into the prescribed languages. (b) Any translation of the said report shall be prepared by or under the responsibility of the International Bureau, whereas any translation of the said annexes shall be prepared by the applicant. The report and any annex shall be in the language in which the international application to which they relate is published, or, if the international preliminary examination is carried out, pursuant to Rule 55.2, on the basis of a translation of the international application, in the language of that translation. (a) Any elected State may require that the international preliminary examination report, established in any language other than the official language, or one of the official languages, of its national Office, be translated into English. (b) Any such requirement shall be notified to the International Bureau, which shall promptly publish it in the Gazette. The International Bureau shall transmit a copy of the translation referred to in Rule 72.1(a) of the international preliminary examination report to the applicant at the same time as it communicates such translation to the interested elected Office or Offices. In the case referred to in Rule 73.2(b)(ii), the written opinion established by the International Searching Authority under Rule 43 bis.1 shall, upon request of the elected Office concerned, be translated into English by or under the responsibility of the International Bureau. The International Bureau shall transmit a copy of the translation to the elected Office concerned within two months from the date of receipt of the request for translation, and shall at the same time transmit a copy to the applicant. The applicant may make written observations as to the correctness of the translation of the international preliminary examination report or of the written opinion established by the International Searching Authority under Rule 43bis.1 and shall send a copy of the observations to each of the interested elected Offices and to the International Bureau. 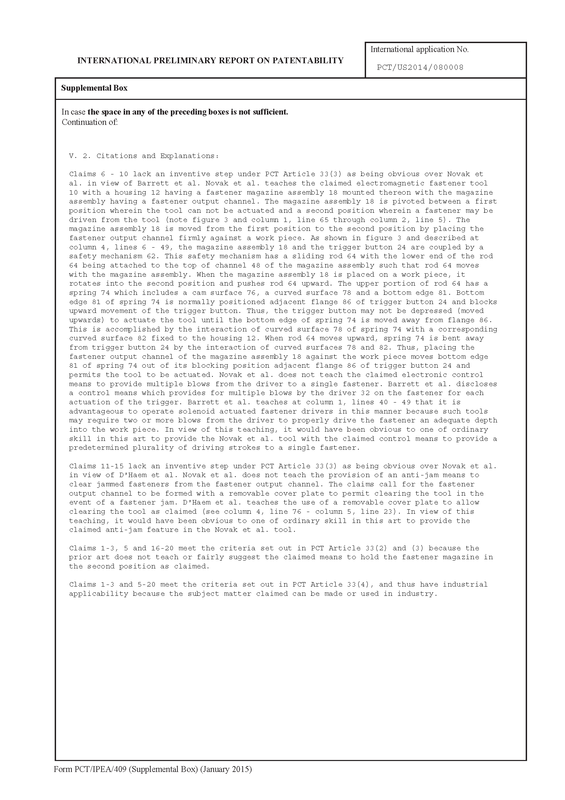 The written opinion established by the International Searching Authority and the international preliminary examination report and any annexes are established in Arabic, Chinese, English, French, German, Japanese, Korean, Portuguese, Russian or Spanish, if the international application was filed in one of those languages or translated into one of those languages. See PCT Rules 48.3(b), 55.2 and 70.17. Each elected State may require that the written opinion and/or the report, if it is not in (one of) the official language(s) of its national Office, be translated into English. See PCT Rule 72.1(a). In that case, the translation of the body of the written opinion and/or report is prepared by the International Bureau, which transmits copies to the applicant and to each interested elected Office. If any elected Office requires a translation of annexes to the report, the preparation and furnishing of that translation is the responsibility of the applicant. See PCT Article 36(2)(b). The U.S. requires the final report and the annexes thereto to be in English. Translation of the annexes for national stage purposes is required pursuant to 35 U.S.C. 371(c)(5) and 37 CFR 1.495(e). Failure to timely provide such translation results in cancellation of the annexes. 37 CFR 1.11 Files open to the public. (a) The specification, drawings, and all papers relating to the file of: A published application; a patent; or a statutory invention registration are open to inspection by the public, and copies may be obtained upon the payment of the fee set forth in § 1.19(b)(2). If an application was published in redacted form pursuant to § 1.217, the complete file wrapper and contents of the patent application will not be available if: The requirements of paragraphs (d)(1), (d)(2), and (d)(3) of § 1.217 have been met in the application; and the application is still pending. See § 2.27 of this title for trademark files. (3) Access to international application files for international applications which designate the U.S. and which have been published in accordance with PCT Article 21(2), or copies of a document in such application files, will be permitted in accordance with PCT Articles 30 and 38 and PCT Rules 44ter.1, 94.2 and 94.3, upon written request including a showing that the publication of the application has occurred and that the U.S. was designated. For a discussion of the availability of copies of documents from international application files and/or access to international application files, see MPEP § 110.